When times get tough, we all reach for comfort food. Dinner at Alinea, however tempting it may be, just doesn't warm up cold toes the same way that a bowl of soup does. Many comfort foods have the additional advantage of being relatively inexpensive, another thing that gives it a boost over spendy restaurants right now. One of my favorite comfort foods is oatmeal. 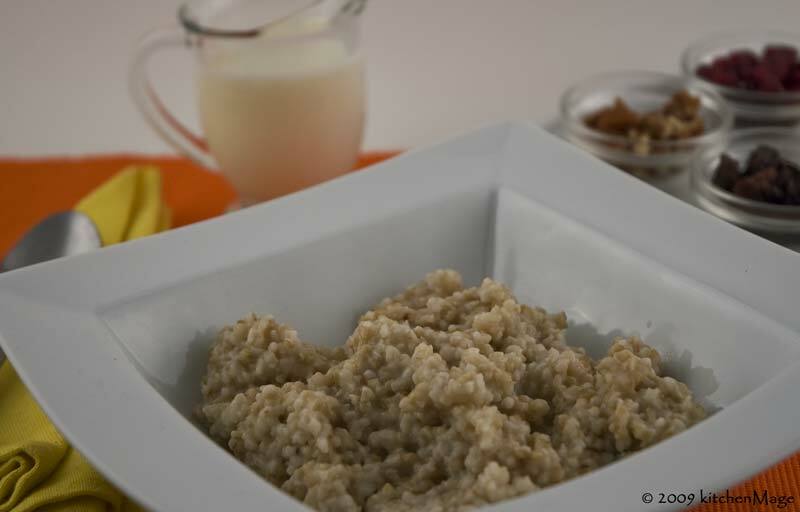 Simple, homely, and (important in these times) cheap oats make a tasty breakfast that won't leave you hungry in an hour. My choice is steel-cut oats, which are just chopped up bits of whole oats. The more common rolled oats, while quick to make, lack much of the flavor and texture of their steel-cut cousins. Boring! This recipe, from my new cookbook, Picture Yourself Cooking With Your Kids is my answer to the time issue. Prepared in a few minutes and left on the back of the stove overnight, you can heat a bowl of oats in less time than it takes to make your morning coffee. These hearty oats will keep in the refrigerator for about 5 days, so you can make up a big batch on Sunday night and heat just enough for breakfast each morning. In the evening, bring water to a boil in a saucepan. Stir in oats, cinnamon and salt. Cook over medium heat, stirring occasionally for 10 minutes. Remove from heat, cover, and leave on the back of stove until morning. In the morning, heat the oats in the pan over medium-low heat for a few minutes, stirring occasionally, until the oats are hot. Alternatively, you can heat a bowl of oats in the microwave on high for 1-3 minutes, stirring once or twice. Choose different fresh or dried fruit and other toppings to add to the oatmeal to keep it interesting. Here are a few suggestions. Grate an apple into the oats in the morning before heating it. Cut up a few dried apricots with scissors, add some chopped almonds and drizzle in some maple syrup. Slice a fresh banana into the oats, add some raisins, and sweeten with a little honey. There are a thousand other combinations of goodies to drop in your bowl of oats. How about you: how do you like your morning oatmeal? Please share your favorite oatmeal toppings in the comments.